Poo to baddies! 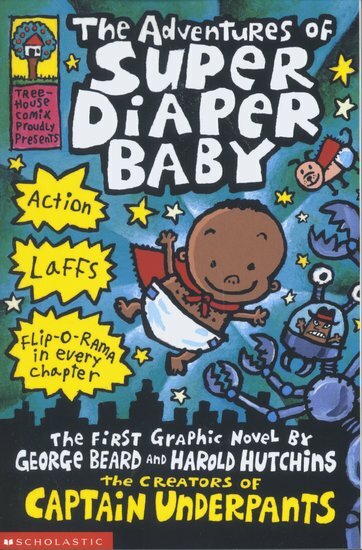 This nipper in nappies is saving the world! Mini superhero Super Diaper Baby is faster than a speeding buggy and tougher than nappy rash. He can even leap over tall buildings without getting his diaper dirty. You have been warned! Don’t mess with him! Yup: this nappy-clad newborn loves to fight crime and tackle evil baddies. But can he save the planet from the diabolical Deputy Doo-Do: a walking, talking, radioactive lump of you-know-what? I loooooooooooved this book because I liked it when the deputy turnd into deputy doo doo.